Do you wear buttonless sweaters? Or maybe hand knitted shawls? 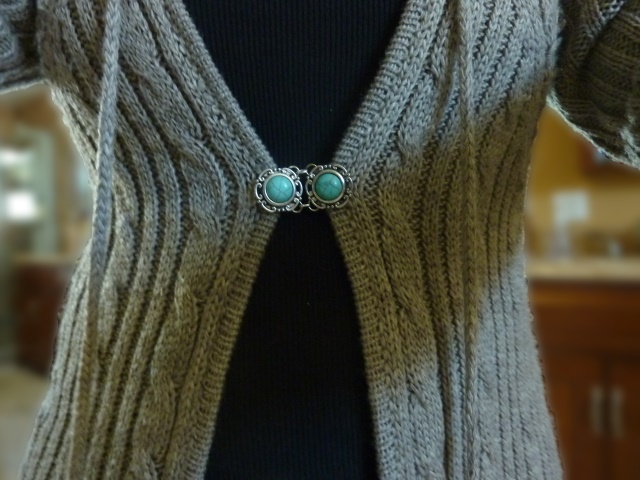 Then you'll appreciate this sweater (or shawl) clip tutorial from Beaddiagrams. These pretty accessories keep the sweaters nicely cinched for a flattering look and shawls firmly on your shoulders. The tutorial is quick and easy to do. The clever part is the use of ear clip findings which are glued onto the backs of the beads or connectors. The picture above shows connectors link together with just jump rings. The designer really wanted clips which are closer together so the wiring of two flat round beads together for another design achieves that. Chains are optional but really, these are good insurance for not losing the clips should one come undone. Apologies if this is a duplicate; I tried to reply earlier. Love this idea. Have you seen the Jul closures for knits? It’s removable too. It uses a screw with a screw back. No I haven't so I visited their site. What lovely designs and ideas! !